In this extraordinary narrative, Alan Tennant recounts his all-out effort to radio-track the transcontinental migration of the peregrine falcon -- an investigation no one before him had ever taken to such lengths. On the Wing transports us from the windswept flats of the Texas barrier islands -- where the tundra falcons pause during their springtime journey north -- to the Arctic, and then south, through Mexico, Belize, and into the Caribbean, in a hilariously picaresque and bumpy flight. At the helm is Tennant's partner in falcon-chasing, George Vose, a septuagenarian World War II vet who trusts his instincts as much as his instruments. 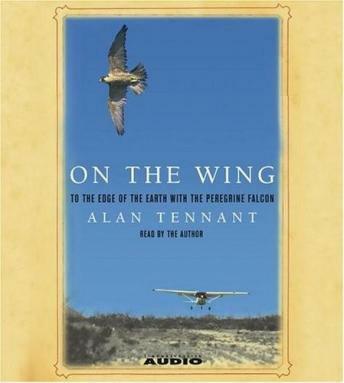 As the two men nearly lose their lives and run afoul of the law in the race to keep their birds in view and their rattletrap Cessna gassed up and running, Tennant renders with gorgeous precision and skill the landscape and wildlife they pass on the way and the falcons that direct their course. On the Wing is a breathtaking encounter with these majestic birds -- the icons of pharaohs, Oriental emperors, and European nobility -- whose fierce mien, power, and swiftness have fired the human imagination for centuries. This is an unforgettable tale that speaks to all our dreams of flight. This was a very enjoyable tale, with elements of adventure, aviation, and falconry. The account makes the birds' feat of migration more real and all the more impressive. The author's voice is extremely annoying. But once you get past that you find that the details and descriptions are so tedious and tortuous at times...I couldn't listen for very long at all.